The Nintendo NX mystery is over, but the company will keep us waiting until January to say how much it will charge for Nintendo Switch. That's a bit inconvenient. You've gotta know how much cash to start socking away so you can buy a Switch and The Legend of Zelda: Breath of the Wild (please be a launch title, please be a launch title), Switch Pro Controller and an official Nintendo Switch Onesie all together, right? Nintendo did confirm one detail at the Japanese meeting where it announced the January event for Switch, according to Wall Street Journal reporter Takashi Mochizuki: the Switch won't be sold at a loss. And thus the speculation begins. So how does this tell us anything? Companies sometimes choose to lose money by pricing one product below the cost required to create and sell it, in the hopes of making that money (and more) back from related products like games. It's a fairly common practice with console manufacturers, especially early on in a system's life when parts are more expensive. Nintendo isn't doing that here; each Switch sold will be a zero-loss transaction at the worst. In other words, it probably won't be as cheap as we're all hoping. What do previous launches tell us about Nintendo Switch's price? Nintendo's talking about Switch as a home console that you can take with you on the go, instead of a handheld system that you can plug into your TV. The implication is that Switch will be priced more like a home console instead of a handheld (the latter are typically less expensive). So let's take a look at the launch price(s) for Nintendo's most recent home console. Wii U launch price: $349/£299 for Deluxe, $299/£249 for Basic in November 2012. Sold at a loss? Yep, which was pretty uncharacteristic for Nintendo. This is our closest point of reference, but there are still a few key differences - like that bit about Nintendo selling Wii U for a loss. That had to sting, considering the slow sales of both Wii U systems and games. Including the full home console and the wireless-streaming GamePad in every box drove up Wii U's price, but Switch's design is a bit simpler: the main console is the central part with its own screen, and the part that plugs into your TV is just a wired dock. Now let's take a look at 3DS. Nintendo 3DS launch price: $249/£229 in March 2011, $170/£170 after price cut. Sold at a loss? Not at first, but Nintendo started taking the hit just months after with a big price cut. Nintendo says it isn't trying to replace 3DS as its dedicated handheld console, so the comparisons for Switch are less direct. But the massive price drop early in 3DS' life is worth noting. Ever since then, Nintendo hasn't exceeded $199/£179 for the various iterations of its handheld system (not counting bundles that also include games), which leaves a decent price difference between it and Deluxe Wii U bundles. There's one more potentially illuminating data point to bring in, thanks to the close collaboration between Nintendo and Nvidia on Switch's internal tech. Nvidia Shield Tablet K1 launch price: $199/£149 in November 2015. Sold at a loss? Unknown, but Shield Portable wasn't, so probably not. Nvidia Shield Tablet K1 is a little tablet meant for gaming. It can play Android games natively and can also stream PC games via a subscription service or in-home networking. The Shield Tablet uses an Nvidia Tegra mobile processor and has a decently sized mobile screen, just like Nintendo Switch. 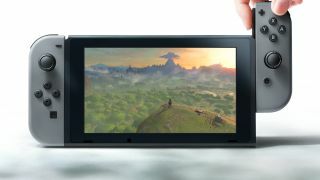 But Switch almost certainly won't be able to lean on streaming powerful PC games from external hardware, so its custom Tegra processor will need to be more muscular. And unlike a Shield Tablet, Switch will come with Joy-Con controller attachments, a dock, and potentially more accessories, which will drive up the price. And then there are the other console companies to think about. No one has launched a major gaming system for more than $499 since Sony birthed a thousand memes with PS3's five-hundred-ninety-nine-US-dollars price tag. The typical price for a high-end console bundle from Sony or Microsoft is $399, with more modest offerings coming in around $299. I don't think Nintendo will set Switch up as a direct competitor to PS4 Pro at $399 since it won't be as powerful and doesn't have an established presence. Xbox One Scorpio will come out several months after Switch and doesn't have a confirmed price so that's harder to figure in. For now, I estimate Nintendo Switch's launch pricing will be $349/£299. It's unlikely that all of this custom technology could come together in such a small package for any less while still coming out even for Nintendo. If that sounds expensive for a console that probably won't be as powerful as PS4 or Xbox One, you're not wrong. But those have been out for years and Nintendo's hoping to make Switch the new transforming hotness - not to mention small, sturdy parts ain't cheap! If it helps, I could see a scaled-down bundle with less built-in storage and fewer accessories (such as the charmingly canine Joy-Con grip) coming in around $299/£249. But remember when folks thought the GamePad was just an add-on for Wii? Wii U's "Basic" and "Deluxe" dichotomy led to even more consumer confusion. It also left some buyers with consoles that were barely big enough to install a handful of games. Nintendo may want to play it safe with a single package this time. Either option would leave a clear price differential between Switch and 3DS, which is essential if Nintendo plans to keep both systems moving in the future. That's a whole lot of speculation from past data, though. The really important thing for Nintendo to consider when it sets the initial price point for Switch is how much people will be willing to spend on the system. How about you?